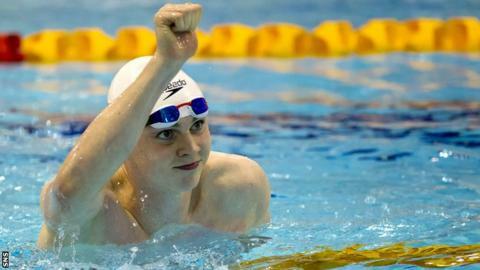 Ross Murdoch broke the British record and recorded the fastest time in the world this year in winning the 50m breaststroke final at the Scottish National Open Championships in Glasgow. The University of Stirling swimmer, who finished in 27.28, was one of six finalists who achieved the Commonwealth Games qualification time. Murdoch said: "I came into the meet unrested, so it is a big relief. Mark Tully (East Lothian Swim Team) took silver, while Joe Welstead (Stirling Swimming) won the bronze medal at Tollcross International Swimming Centre. Cameron Brodie was delighted to defeat University of Stirling team-mate Lewis Smith in the 200m butterfly final with a fingertip finish, both within the qualification standard. "That was a stressful race, but I'm delighted," said Brodie. "I was a bit too hyped up for the final and went out far too fast, I knew Lewis was coming back at me, but somehow managed to hold on - it's a great feeling." Kathleen Dawson also posted a Team Scotland qualification time in winning the 50m backstroke final. Stephen Milne (Perth City) edged out Craig Hamilton (Warrender Baths) in the men's 1500m freestyle, both their times being within the qualification standard.